There is much good to report from a losing effort, which was the result of our Cruising Spinnaker class entry in The Border Run race from Newport Beach to San Diego last weekend. Our noon Saturday start among the leaders at the favored end of the starting line turned into a late-morning finish Sunday at 10:07:11. Only one boat was slower, albeit by more than three hours, which gives you a good idea of what happened to the wind Saturday night and Sunday. The first of the ten finishers in our class crossed the line at 2:23 a.m. Two more crossed during the three o'clock hour, two more during the six o'clock hour and the other three during the eight o'clock hour. Word afterwards was that boats that stayed close to the shore did better than those farther out. We raced on PHRF handicap ratings, which ranged from 102 to 198. "Narrow Escape's" rating is 186. In our case the rating was no factor. We finished ninth overall and were ninth on corrected time by wide margins. 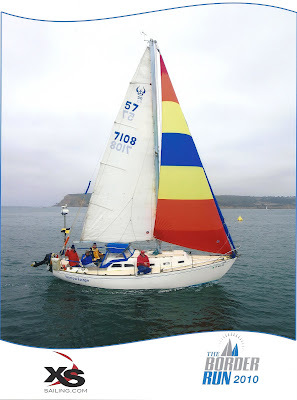 We sailed essentially a rhumb line course from the start off the Balboa Pier to the mandatory rounding of the "SD" buoy marking the entrance t0 the San Diego harbor channel. The wind was light out of the west, providing a beam reach on the apparent wind and a boat speed averaging around five knots during the daylight hours Saturday. That is less than our six-knot hull speed. We stayed with the 155% genoa, which was pulling well. Many other boats hoisted spinnakers, but nobody seemed to be running away. We even stayed close to a Catalina 320, a faster boat, much of the day, feeling good about that even though it wasn't in our class. Last year there was a lull in the wind for a couple hours from about 8 p.m. to 10 p.m., then it came in strong and steady from the southwest and we finished at 1:17 a.m. We still were next to last place (fourth of five boats) but were only 39 minutes behind the winner on corrected time. This year we were nearly six hours behind the winner on corrected time. Not that we didn't try hard. As the wind began dying we hoisted the gennaker and kept the boat going. When the gennaker began to go limp between the occasional zephyrs and the main was slatting side to side in the waves, we dropped the main to quiet the boat and eked out a few more tenths of a knot. Around midnight when the gennaker was no longer pulling, we hoisted the "windseeker", essentially a 100% jib sewed from spinnaker cloth. That kept us moving. When the wind shifted to a land breeze from port side, we got the boat into the two knot range and hoisted the main and rolled out the genoa again and doused the gennaker. But in twenty minutes it was calm again and we furled the genoa and hoisted the windseeker again. Around 2:30 a.m. my watch ended and freshly-rested crew took over only to cope with even worse conditions. When I came back up in about three hours we had moved down coast three or four miles. A great, congenial crew of Nate Tucker, often first to finish Long Beach Harbor series races in the 1979 Catalina 30 he has owned since it was new; Hobby Hobson, who has far more racing experience than me, crewing on a variety of boats, and Geoffrey Vanden Huevel, who races his Capri 25 against Nate. Good food rounded up by Nate, who abided by my simple commandment: "I'm not cooking this year." We ate cold KFC chicken and made cold sandwiches from ample mounds of deli meat and munched on SunChips and chocolate chip cookies, and breakfasted on our choice of cold cereal or hot oatmeal. Nothing broke. Everything worked on the boat. Not that I didn't dream up some things to buy for the boat as soon as I get the chance. The best photo ever of "Narrow Escape" by the photographer aboard the committee boat at the finish line. And there were no other boats to get in the way of taking a picture of our joyous moment. Our guest tie-up at the Southwestern Yacht Club. It's beautiful new clubhouse had only been opened the day before. We enjoyed a fine lunch in the spacious dining room overlooking their docks. A nice room at the Kona Kai Hotel across the channel and wonderful courtesy van service, not only from and to the yacht club, but also to a restaurant for dinner Sunday night. Now I look forward to what "Narrow Escape" and I do best -- a single-handed cruise to Catalina in a few weeks. As "Narrow Escape" made the long, cold journey north to Long Beach from San Diego after placing ninth in its ten-boat class in The Border Run race (another blog coming about that), these three birds joined us at separate times. The first bird seemed exhausted, barely able to hang on to the dodger. It moved around several times during about 10 minutes and flew away. The second bird, all shades of black, gray and white except for the yellow spot above the beak, was more energetic and more curious. It flew in and out of the cabin several times and left the boat and returned several times before it, too, disappeared. The third bird, with its brilliant yellow patches, seemed to enjoy the boat a great deal. It hopped around everywhere, including disappearing for awhile inside the cockpit coaming compartments. Eventually it ventured into the cabin, hopping down the companionway ladder step by step and then returning to the cockpit by hopping up the steps. Later it flew in and out of the cabin repeatedly, including two times when somone was going up or down the ladder. We crumbled a SunChip for it, which it enjoyed trying to crunch in its sharply-pointed beak. Finally the bird grew comfortable enough with its new surroundings to hop onto our feet, legs and arms as it moved about. But it resisted our efforts to feed it crumbs from our hands. The third bird, too, flew away from the boat briefly many times but always quickly returned. Then it disappeared. About a half hour later I found it asleep on the cabin sole obscured by a trash bag stashed in a corner of the galley. Later it was gone, not to be seen again, leaving behind three small belly feathers. 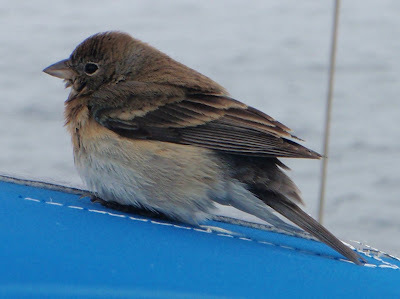 To find out what these birds were and why they might be on our boat, I turned to my daughter, a bird biologist who is chair of the biology department at the University of Portland (OR). Below are excerpts of our correspondence. 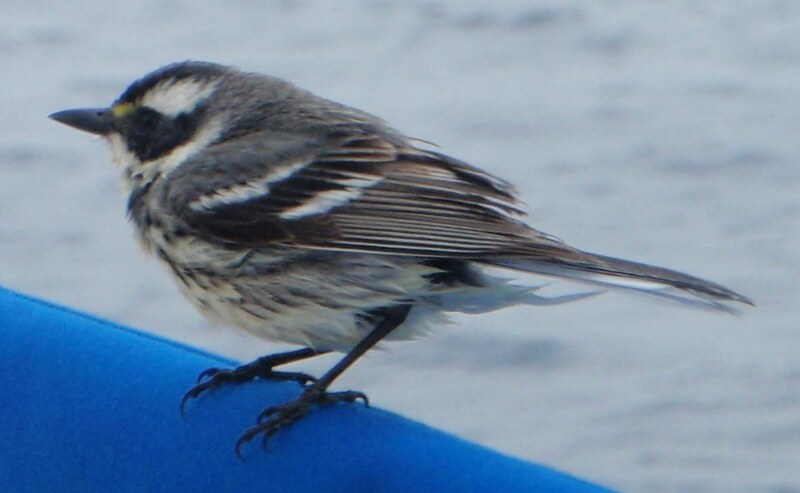 ... What puzzled me is what happens to little birds like this when they leave the boat. Do they know how to fly home? Where is home? Are they social birds or lone rangers? Have they lost their families forever because they spent time on a passing boat? Those are wonderful pictures Dad!!! 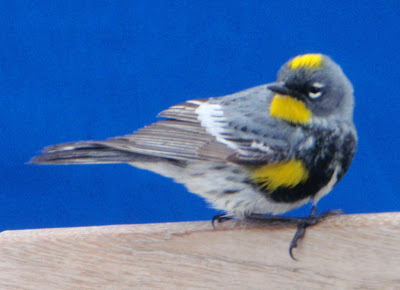 The one with the little yellow spot between its eye and bill (called the lores) is a female black-throated gray warbler. Winters in Baja and central America and breeds in the Western US up to BC and over to Denver actually. Cutie pie! The last one with all the yellow on it is a full breeding plumage male yellow-rumped warbler. This is the western race, Audubon’s warbler. Same sort of wintering and breeding range so these guys are just migrating up to their breeding grounds. You probably weren’t that far off the coast so it looks like they were taking a break and perhaps ran out of a little gas themselves without any prevailing winds. The first bird has me stumped still. I’m going to send your pic to some friends and see what they come up with. Wow – good thing I asked some friends. Ron LeValley, treasurer of Pacific Seabird Group and an avid birder, ID’d our mystery bird as a Lazuli Bunting, female. I don’t think I would’ve figured that one out, but sure enough, staring at the field guide now, I can see that it must be. I couldn’t see this well in the picture, but the rump is blue – kind of a gunmetal blue, but you can see a few of those feathers in your picture. Another species that winters in Mexico and breeds in the western US so it’s just migrating north. You were the easiest way to migrate for these 3 species! Pretty interesting stuff. I’ll look forward to seeing these pics and IDs in your blog Dad! Great information Katie. And now I understand why no birds hopped aboard when we traversed the same waters headed south during the race. We probably were 8-10 miles offshore when these hitchhikers came aboard. What do they eat?